I grew up in Scottsdale, AZ and then moved to Gainesville. I attended the University of South Florida and graduated with a bachelor’s degree in finance. After attending college, I worked in both the sales and finance industries. I have family ties in the real estate and construction industry in Gainesville. I am passionate about assisting buyers and sellers with their needs. In his free time, I like to run, play basketball, travel, spend time with my family and play with my Great Pyrenees dog, Kody. 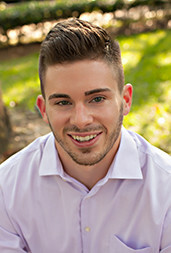 To contact Josh, you can call him at 352-888-4558 or email him at josh@pepinerealty.com. I grew up in Scottsdale, AZ and then moved to Gainesville. I attended the University of South Florida and graduated with a bachelor’s degree in finance. After attending college, I worked in both the sales and finance industries. I have family ties in the real estate and construction industry in Gainesville. I am passionate about assisting buyers and sellers with their needs. In his free time, I like to run, play basketball, travel, spend time with my family and play with my Great Pyrenees dog, Kody. • WSJ Ranked Top 250 Teams in the USA 2017 • Large Business of the Year 2017 • Best of the Best Real Estate Company 2017 To contact Josh, you can call him at 352-888-4558 or email him at josh@pepinerealty.com.